In 2014, Hilda Rivera started her academic journey with Peirce College in hopes of gaining the degree she needed for the career she deserved. By June of 2016, Hilda proudly accomplished this goal when she earned her bachelor’s degree in Healthcare Administration. But her story doesn’t end there – Hilda decided to continue on with her education by looking into earning her master’s degree. Due to her previous experience with Peirce College, the opportunity to earn graduate level credits during her undergraduate experience and because the College was officially launching a master’s program in her field of study, Hilda knew where her next journey would take place. So without any further hesitation, Hilda was the first student to enroll in Peirce’s new Master of Science in Healthcare Administration (MSHCA) program! Fast-forward to June 2018, after balancing work, school and life once again, Hilda was ready and eager to cross the commencement stage once again, but this time Hilda would cross as the first ever graduate of the Master of Science in Healthcare Administration program. 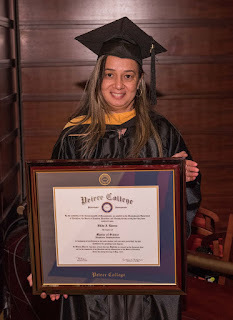 Once inspired and ready to head back to school, Peirce College was a top choice for Hilda not only because of their corporate partnership with her employer, but she was also impressed with Peirce’s unwavering commitment to working adult learners. Adult learners have the complexity of juggling work and family obligations with the added element of returning to school. “My experience was different from a traditional-age student. I focused more in class, managed my time wisely and was able to integrate what I learned in class with my experience at work,” Hilda remarked. We are so very proud of Hilda’s accomplishments and congratulate her on the completion of the MSHCA program.